Insurance agency Kramer Kirsh Insurance Group is raising funds for The Leukemia & Lymphoma Society together with Michael, a local boy who was diagnosed with leukemia in 2014. Michael will be taking part in the Society’s Light The Night Walk in October. The raised funds from the walk will help support the research and treatment of blood cancers. 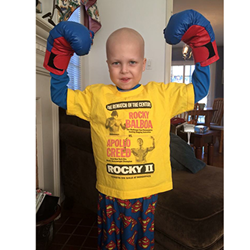 Local insurance agency in Newtown, PA, is raising funds for The Leukemia & Lymphoma Society together with Michael, a young boy who was diagnosed with leukemia in 2014. Michael will be taking part in the Society’s charity walk Light The Night Walk in October 2016, and he is dedicated to raising much-needed funds to help the Society fund research and treatment of blood cancers. Despite his own struggles with the illness, Michael is extremely passionate about helping others. Kramer Kirsh Insurance Group is proud to join him in his effort to raise as much as possible toward the $10,000 goal. The fundraising page can be accessed here: http://pages.lightthenight.org/epa/BucksCo16/walkwithmee. “Our goal is to help Michael raise funds and awareness for The Leukemia & Lymphoma Society in order to support his battle until he fully overcomes leukemia,” said Greg Kramer, the principal at Kramer Kirsh Insurance Group. The agency will donate $10 to the cause for each person recommended to the agency for a quote – no purchase necessary. Anyone willing to help this campaign can recommend someone they know might need a new insurance evaluation for their auto, home, life, and more. With an office in Newtown, PA, Kramer Kirsh Insurance Group is employing its social media channels and email communications in the campaign, and dedicating a full page of their monthly magazine to the cause. The electronic version of Our Hometown magazine can be viewed here: http://www.kramerkirshinsurance.com/Our-Hometown-Magazine_39. Operating as agents of change in the community, Kramer Kirsh will continue to work for causes like Michael’s. Any members of the community can request to be considered for future campaigns through this link: http://www.kramerkirshinsurance.com/Add-Community-Cause_57. Entries are diligently submitted for review, and the elected worthy causes are properly contacted by a representative of Kramer Kirsh’s Community Program. More information regarding past and current campaigns supported by the agency can be found at http://www.kramerkirshinsurance.com/community-cause.